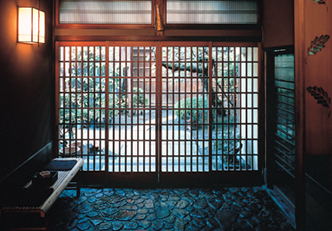 The lattice entrance is the classic style of the Japanese ryokan. Such latticework can be found at historic ryokans in the ancient capitals of Nara and Kyoto. Two o’clock in the afternoon. At the ryokan, all preparations have been completed for welcoming the guests. Looking forward to the safe arrival of guests, in a fresh frame of mind, every day. This attitude toward welcoming guests can be likened to motherly affection, waiting eagerly for the family members to come home in good spirits. Stepping inside the entrance, guests arriving at a Japanese ryokan will first receive a courteous welcome from the attendants headed by the Okami. The more courteous and the more sincere the initial greetings, the higher the quality of service you can expect at the ryokan. Once the very deep bows of welcome are over, those guests arriving slightly early are sometimes invited to take a seat in the lobby after signing the register at the front desk. This provides the guests time to rest and recover from the fatigue of their journey. The most common check-in hour at a ryokan is around three o'clock in the afternoon, although it differs slightly from one ryokan to another. If you prefer, it is possible for you to be shown straight to the guestroom. However, we highly recommend spending some time to relax in the lobby, where you can enjoy the beautiful views from the windows as well as the luxurious interior design and ornaments.